What Is Genius…A Certain Too-Much-Ness? When I moderated a panel called “Deconstructing Genius” last week at the 92nd Street Y Dance Center, I kept away from trying to define genius. 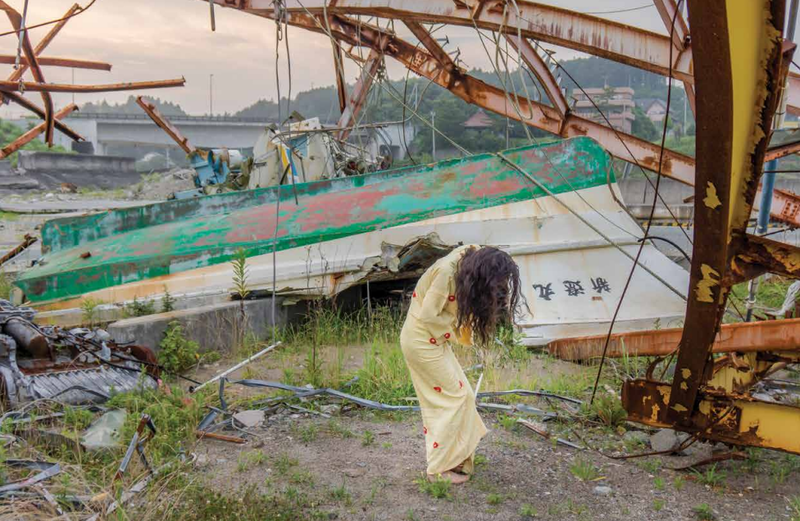 All four panelists—Martha Clarke, Eiko Otake, Michael Moschen, and Elizabeth Streb—have received MacArthur fellowships, commonly called the “genius award” in the press. But the MacArthur Foundation never uses that word, and some of the panelists found the term less than useful. What I see in these four amazing artists is a strong vision that allowed them to be utterly individual. More than that, they have each forged a path that eludes existing categories. They are the explorers of our time. Now that the panel is over and I don’t have to worry about burdening anyone with that term, I want to name a few things that could qualify an artist as a genius—or at least an extraordinary artist. But if there are geniuses among us, here are some attributes I would say mark such an artist. • The second is curiosity—aimed curiosity. As each of these artists talked about their attraction to the unknown, they sounded to me like the great explorers—Marco Polo or Lewis & Clark—people who see a path that no one has taken, who have a sort of lusting for the unknown. 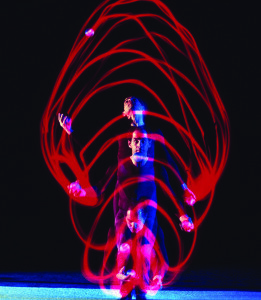 Each of these artists have transgressed passed boundaries and transformed our idea of the performing arts. • The third thing is plain hard work. As Eiko had said when I invited her onto the panel, “I am peculiar and a workaholic, but that doesn’t make me a genius.” I agree that those two criteria are not enough. But what Eiko doesn’t realize is that she—as part of the duo Eiko and Koma, and now on her own—has a third thing that is indefinable, and that is what makes her utterly unique. There’s no doubt that sheer hard work plays a role in bringing that uniqueness to light. But when Eiko was describing the late Kazuo Ohno, whom she does accept as a genius (to read Eiko’s beautiful obit on him, click here and scroll down) she talked about his “too-much-ness” and then admitted she also has this too-much-ness. And that’s what rang true for everyone on the panel. Alessandra Ferri & Herman Cornejo in Martha Clarke’s Chéri. Photo by Christopher Duggan. When Martha Clarke described her piece Endangered Species, with Flora the elephant, a few monkeys and a horse, it sounded like too much. 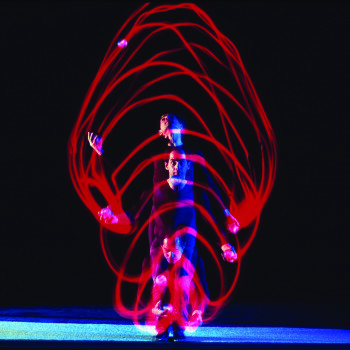 When Michael Moschen described the Chinese jugglers he learned from, their devotion to a single skill seemed too much. And Streb talked about the willingness to be impractical and “underground.” Although certainly her above ground actions—often high above ground—are wonderfully impractical. When you see Streb’s dancers leaping from great heights and making a pattern in space, that’s “too much”—meaning, overwhelming. I think too-much-ness is the ability to go all out in one direction, to throw caution to the winds, to be totally immersed in your idea. Of course there are genius criminals too. And there are artists whose too-much-ness is merely “over-the-top” tastelessness. But as Eiko pointed out, when the MacArthur Foundation sends a letter of congratulations to its chosen fellows, it thanks them for their contribution to humanity. So maybe genius is a too-much-ness that in some way elevates humanity. And then, and then…you have something to give to the rest of us. With the help of Tchaikovsky, my body got swept up in the glorious sequences of Serenade. This was last Friday, when Kaitlyn Gilliland taught part of Balanchine’s choreography to a bunch of downtown types at the Danspace Project. The workshop was part of Claudia La Rocco’s brainstorm, Platform 2015: Dancers, Buildings and People in the Streets. I think Edwin Denby would have been happy. 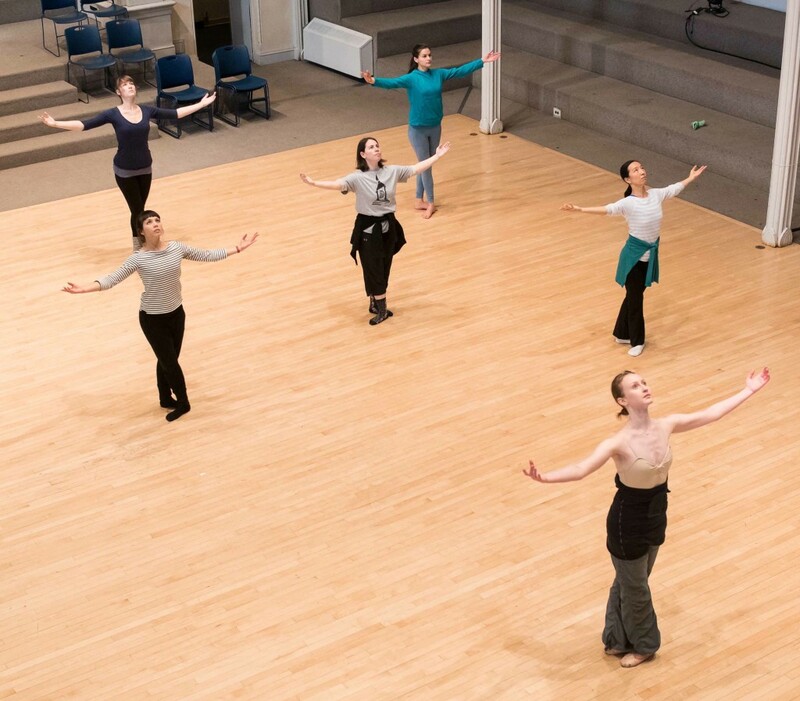 The platform was inspired by Denby’s three-point dance interest in the ’60s: Balanchine, Cunningham, and Judson Dance Theater. La Rocco’s curiosity led her to pair Balanchine dancers with post-Cunningham dancer/choreographers. Gilliland, a beautiful young dancer who couldn’t quite fit in at New York City Ballet, is now freelances with smaller groups. But during her years with NYCB she danced Serenade many times, often as the Dark Angel. Gorgeous torso movements, like a big side bend or an undulation in parallel that travels up the spine, are what give the ballet its wind-blown look. Although my legs don’t work like they used to and my feet cramp up when I try to point my toes, my upper body felt those shifts as pure pleasure. As you opened your sternum upward to the stained glass window in the dome of St. Mark’s Church, you felt like you could touch divinity—or at least George Balanchine. However, I am (or was) a modern dancer and choreographer, and although I grew up training in ballet, there were some things in this workshop that my body/mind refused to do. One is what I call icky fingers. Kaitlyn explained that all fingers in ballet should be separate. Well, I spent enough time as a teenager at the School of American Ballet sticking the pinky out, that my adult hand just wouldn’t do that. Also, I think icky fingers are a gender thing: most ballet men hold their fingers loosely together rather than feathering them prettily. At another point Kaitlyn advised us to squeeze — I think that was in relation to the legs having to suddenly open from parallel to first. I blurted out, “We don’t squeeze downtown.” As Janet Charleston put it later: “We don’t squeeze but we engage.” It’s a different way of articulating muscle usage, and a different aesthetic. But there were other aspects of Kaitlyn’s workshop that a modern dancer could relate to. 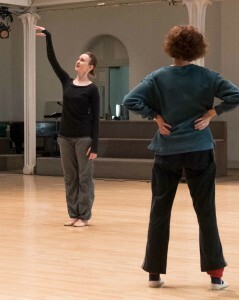 When she described being centered as making constant adjustments, and showed us how she keeps moving even when standing in place, I thought, That’s Steve Paxton’s “small dance.” When she waved both arms to the left, seaweed style, it looked like an Isadora Duncan movement that found its way into Michel Fokine’s Les Sylphides. (Fokine was influenced by Duncan at the time he made that famous ballet). When answering our questions, Kaitlyn had a quiet wisdom. She kept everything fluid, whether it had to do with shifting direction from flat side to éffacé, or how she felt about working in a hierarchical company. Her answer to the last question was, It changed every day. When I think about Balanchine ballets, Serenade is never far from my mind. I once moderated a panel on the ballet for SAB, and I collected quotes from Suki Schorer, Wendy Whelan, Brian Reeder, Lourdes Lopez and others. Earlier this year, when I posted “Start the New Year with Serenade,” I had no idea that I would actually be able to learn some of it. Last year, for added ghostliness of Serenade, I concurred with Elizabeth Kendall’s hunch that the ending (when one dancer, lifted high up, opens her arms to the heavens) was inspired by the mysterious drowning death of young Balanchivadzes’s dance partner at the Imperial School. That theory didn’t come up in the workshop, but the grandeur of those steps to that music could easily stem from some deep spiritual questions. The choreographer came to this country in 1933, nine years after the drowning and his departure from Russia. Couldn’t that tragedy have had a lingering effect? Everyone has a story about Serenade. Kaitlyn read an email on her iPhone from Sterling Hyltin, a principal at NYCB, that painted a lovely picture of the ballet as an ocean setting. Now, after learning a few of the steps and hearing more stories, I can’t wait to see Serenade at New York City Ballet again.